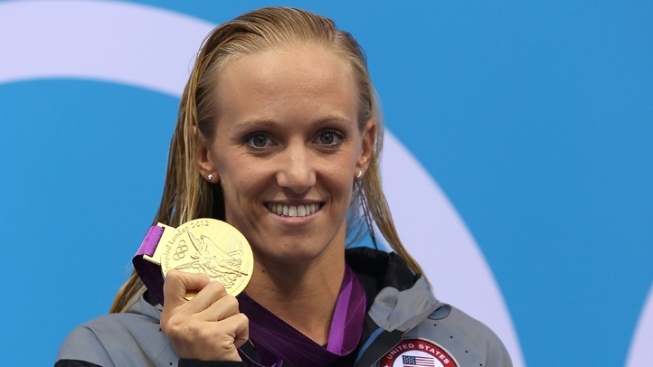 If you ask Dana Vollmer, Wheaties is not the breakfast of champions. Gold medallist Dana Vollmer of the United States poses on the podium during the medal ceremony after setting a new world record time of 55.98 seconds in the Women's 100m Butterfly final on Day 2 of the London 2012 Olympic Games. The Cal graduate and Olympic winner of the 100-meter butterfly -- who also happens to have food allergies -- tweeted on Monday that the meal that won her the race is "rice w/almonds, peanuts, sunflower seeds, peanut butter and milk! I ate this before my swim last night! #GF #eggfree." In an earlier interview with Kidshealth.org, she said she used to load up on carbs before swimming, so "the hardest things for me to give up were pasta and eating eggs for breakfast." Instead, she tries to eat lots of lean meats, veggies and rice. Dietary concerns aside, Vollmer made history when she won the gold medal on Sunday, breaking the 56-second barrier in just 55.98 seconds, setting the world record. Four years ago, Vollmer finished fifth in the 100 butterfly. Not only does Vollmer have food allergies, but the extraordinary swimmer who trains in Berkeley overcame two heart defects as a teen to qualify for the Olympic team in 2008. And in 2004, she had her mom and members of the USA Swimming medical staff carrying defibrillators around, just in case.